With a bold new look, Toyota Highlander is poised to become your favorite family SUV. Whether you’re adventures take you to the rodeo—or to Rodeo Drive—Highlander is ready to take you there in maximum comfort and style. The three-row Highlander features plenty of standard upgrades, plus available options such as a 3.5-liter V6 direct-injection engine and available Direct Shift-8AT (8-speed Automatic Transmission), for those days when you feel the need for unbridled power that takes you beyond the ordinary. Your crew will ride in unrivaled quiet comfort. And safety, too. Every Highlander comes with Toyota Safety Sense™ P; a sophisticated package that uses modern technology—such as an in-vehicle camera and front-grill mounted millimeter-wave radar—to ensure enhanced performance and functionality. And those are just a few of the enhanced, technology-assisted safety features integrated seamlessly into Highlander. With seating for eight, and more than 83 cubic feet of cargo volume behind the front seats, it’s a good bet you’ll find plenty of room for everyone and everything you might want to take on your next adventure. And don’t miss the five USB ports located throughout the roomy cabin. They’re just one more feature designed to keep today’s tech-savvy passengers humming along. Highlander. Let’s go places. Sticker price is one thing. But the true cost of ownership is far less simple to determine when it comes to owning and operating a sophisticated vehicle. Factors ranging from gas mileage, to driving style, to insurance costs, to maintenance and repair costs must all be weighed when determining the actual cost of owning and driving a vehicle. 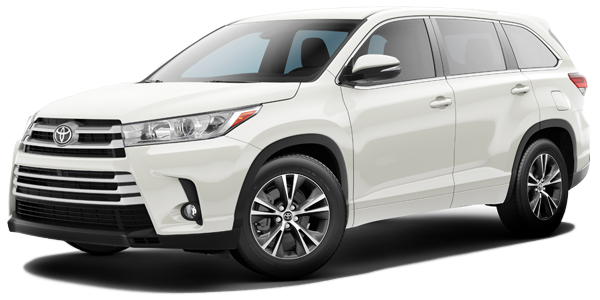 Toyota Highlander comes out ahead of many of its competitors, when you factor in Toyota’s remarkably generous warranties, and perks like the Toyota Care No Cost Service & Roadside package. The package features a no-cost maintenance plan good for 2 years or 25,000 miles, whichever comes first. Resale value is also an important factor involved in determining cost of ownership. Like most Toyota vehicles, Highlander is expected to retain significant resale value over time.